I never thought of making donuts. They always seemed a little out of my league, but after skipping through The Sophisticated Gourmet’s blog I was inspired. I’ve since found two really fabulous recipes; one from Donna Hay, and another from a ratty old cookbook on Mum’s shelf. Combine yeast, warm milk (not hot, or the yeast will die), 1 tbs sugar in a bowl and set aside for 10 minutes in a warm place. Using a stand mixer with a hook attachment, in a bowl add yeast mixture, butter, flour eggs and the left over sugar and knead mixture until a soft dough forms. Depending on the flour, you may have some flour remaining, or you may need to add some more. The ball should be soft and elastic. Leaving the dough ball in the bowl, spray with a little oil, cover with glad wrap and leave in a warm place for an hour or until it doubles in size. Roll the dough out on a lightly floured board until it is roughly 1 – 1.5 cm in thickness. Using a cookie cutter, cut into rounds. If you want jam donuts to not cut a round out of the middle. If you want ring donuts, use a smaller cookie cutter to cut a round out of the middle. Do not throw any of the middle rounds away. They will make delicious mini donuts. Place donuts on sheet of baking paper, and leave to stand in a warm place for 20 minutes. They should rise slightly again. 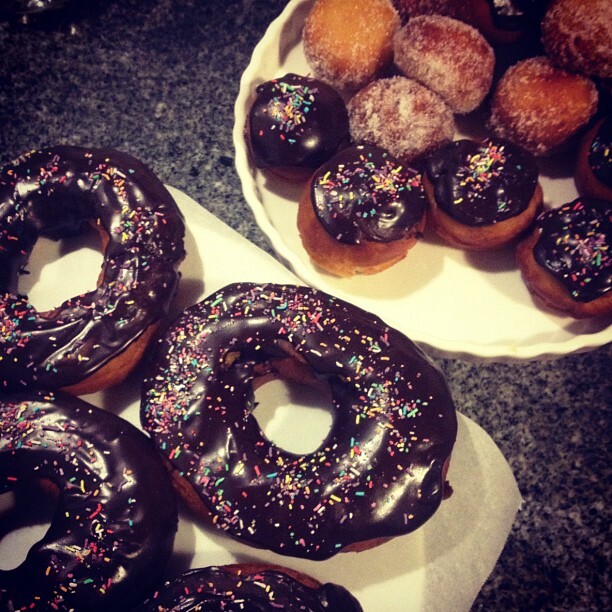 While the donuts are resting, place the vegetable oil in a heavy saucepan over a medium heat. After the donuts have risen, cook in the oil for a 1 – 1.5 minutes on each side or until golden. Drain on a clean tea towel. 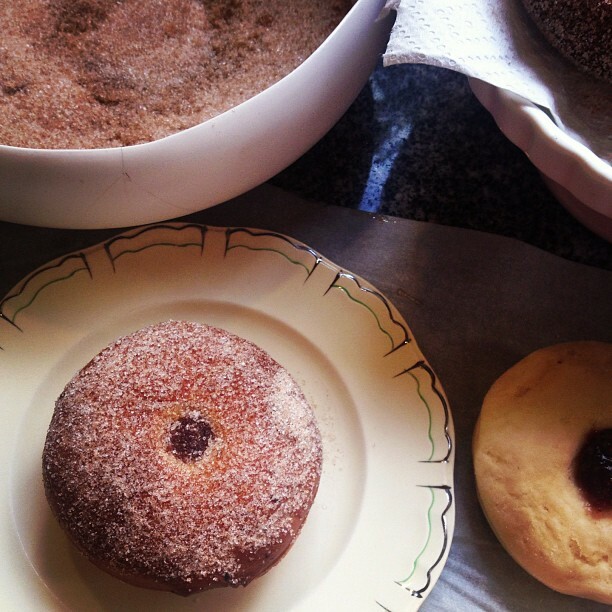 If you are making jam donuts, immediately toss them into the sugar and cinnamon mixture, and using a piping bag, pipe the desired jam into the middle of the hot donut. If you are making glazed donuts, let the donuts cool for 5-10 minutes before glazing. Once you have glazed them, immediately cover the donuts with sprinkles.